Yep. Ready for camping, all right. We’re leaving tomorrow for three days and three nights of camping in the mountains west of Aspen. You could not tell this by looking at our camper right now, buried in the garage under unsold garage sale rejects and boys’ toys. In theory, we will leave in the morning. In theory, after we dig out the camper, hook it to the car, put all the superfluous stuff back into the garage, and load the camper, we will be on our way. In the meantime, we’re having friends over tonight for game night because I don’t like to be bored. Well…I got my wish. I have learned to slow down a bit. It’s hard to tell on days like these when I am being pulled in a million different directions by things I willingly took on before analyzing their potential impact on my mental health. But, I do a lot less these days than I used to. It’s true. It’s simply hard to tell. I’m trying to make memories for my boys. Memories of happy summers playing with friends, exploring, camping, traveling, and trying new things. To accomplish that, there is a lot of planning, coordinating, preparing, and cleaning up to get out of the way. Things get a little hairy for me as the at-home parent. But, I know I am making progress toward becoming more zen…if not in the way of scaling back then definitely in the way of not stressing out as much as I used to. I’ve learned that things have a way of working themselves out. I play this little game with myself to remind myself why life is not worth stressing over too much. For whatever it is that is standing in front of me like an impenetrable road block, I ask myself what is the worst that could happen. For example, what is the worst that will happen if we don’t get the camper cleaned off tonight? Answer: We’ll do it tomorrow and get to the campground a bit later. No big deal. What is the worst that will happen if I forget the boys’ swimsuits for playing in the river? Answer: They’ll swim in their shorts. No big deal. What is the worst that will happen if we don’t get our stuff together to go camping? Answer: We won’t go camping and we’ll lose the $70 in camp fees. The world won’t stop revolving. The kids won’t die. We’ll truly be not much worse for the wear. No. Big. Deal. We’re still busy. I still overload our schedule with “fun” things to do that will cause me oodles of extra work I didn’t need to take on. But, I’ve taken my harried, stress-over-every-little-detail behavior down about fourteen notches. Oh. I still stress. My husband can verify how snippy I can become when he forgets the camp chairs and that was the only thing I asked him to remember. But, I am less uptight than I used to be. Sad, but true. Unwinding is a process. And, for some people like me, it’s a lifetime’s worth of work. And, for some people who have to live with me on a daily basis, my unwinding process isn’t moving nearly fast enough. Ah, the journey from Green-Eyed Monster Mom to Zen Mom. I know it well and wish I were further along in the process! 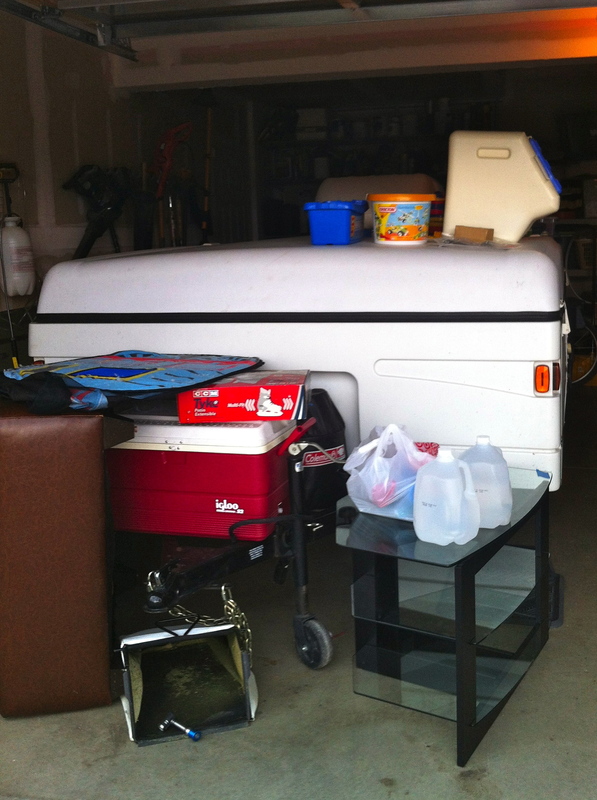 And just for the record, we went camping last week and our trailer looked exactly like that before we pulled it out. Got to the campground four hours late and guess what? Nobody died!